Wrench Rabbit complete engine kits are the convenient single part solution for a complete and professional engine rebuild. Using only the highest quality components from brands such as Hot Rods, Vertex pistons, & Hot Cams, Wrench Rabbit engine kits are a simplistic cost and time savings solution to ordering an array of expensive OEM parts. Our man Ryan Sipes has become the jack-of-all-trades on dirt bikes, from motocross (still top-ten speed at RedBud!) to GNCC and off-road (won a GNCC last year, and he’s the first American to ever win the International Six-Day Enduro overall), and now even American Flat Track. A few weeks ago, our Steve Matthes talked to Sipes during an episode of his Racer X Podcast. While talking about Sipes racing a 125 two-stroke at the Muddy Creek National, the conversation drifted toward injuries and safety. As always, Sipes, a regular contributor to our website, had some interesting analysis and perspective. Here’s their conversation. Steve Matthes: We recently saw a big injury to Jeremy Martin on the GEICO team, an injury that’s going to knock him out for a long time, the rest of the summer. There’s injuries to Zach Osborne, of course. The 450 Class is decimated. We had talked about this on Monday night’s PulpMX show and the injuries and what’s going on with them. What’s your theory? Is it just one of those years? Do we need to really start having a conversation about front and back protection and limiting these bikes a little bit? It’s a difficult subject to tackle. There’s a multitude of things to think about, but as a guy that’s ridden indoors, outdoors, off-roads, all sizes of bikes, all types of bikes, four-stroke, two-stroke—what’s your thoughts, Ryan? Ryan Sipes: There’s arguments every which way. You could say, yeah, make the bikes smaller, but then there’s 250 guys getting hurt as well and they’re on a smaller bike than even you would take a 450 down to. Say you made it a 400 or a 350. There’s guys on the little bikes (250s) getting hurt, too. I don’t know the answer, to be honest. It’s a combination of a ton of things, really. The supercross stuff, I think the guys getting hurt, getting landed on in the triples, that’s fixable, I think. Now, the guys coming up short like Cole Seely, I don’t know what you do about that. It was a miss-timed thing. The easier thing to say is slow the tracks down, but then, do you get good racing with that? From my perspective, you race motocross, and I got hurt a ton. I was young and dumb and didn’t know when to let off sometimes! But other times it wasn’t like I was being stupid, I just got hurt. Then I quit motocross, I go into off-road, and people say, “Do you miss motocross? There’s all those trees out there you can hit now.” There are, but my injury history since I went to off-road has been way smaller, way less injuries than in motocross and supercross. The only difference is the speeds. We don’t get going 60 miles an hour and then hit the jump and things like that. When I talk about the speeds (in GNCC), the pace has picked up. It’s scary to go that fast through the trees, but even at that point, there’s still not guys getting hurt like there are in supercross and motocross. So that’s the easiest thing to say, is the speeds. But I don’t know—how do you do that (slow the speeds)? Is it slower bikes? Is it restrictor plates like NASCAR? Is it change the tracks? I don’t really know, but that’s the one thing that I noticed, the speeds. I think the speeds (have) got to come down somehow. Matthes: The ultimate argument could be that just a few years ago we had a lot of the guys still in the field racing all year, so, actually, it could be just one of those years. It happens. It goes from time to time—one year everyone gets hurt, the next year everyone stays healthy. But there’s no doubt that there’s a lot of money sitting on the sidelines in salaries for these factories, and I kind of wonder if there’s a tipping point of somebody saying, “What are we doing?” Like you said, there’s templates for NASCAR to slow the cars down. The F1 cars, there’s been rules passed to limit technology that limits the car’s abilities. Drag racers can no longer I think go over 300, or they capped it at 300 or something. Every sort or form of racing, and I’m not familiar with MotoGP as much, but almost every single form of racing has said, “You know what? Things are getting a little out of hand. We need to cap some stuff.” And we don’t do anything in motocross and supercross. It is wide open. As long as you meet the cc limits, as fast as you want to make that thing, as much electronics as you want to come in, you can do it. I wonder if there’s a point where we got to be like, “Wait a minute. These things can’t be just perfect.” You remember the four-strokes carburetor days. On an on-off jump or coming out of a turn, you had to be careful. You don’t have to worry about that anymore. Sipes: Yeah, they were scary (carbureted four-strokes). That’s the thing. They came out with 450s and they’re way faster than a 250 two-stroke ever was. But compared to when they first came out, when they first became kind of mainstream, ’02, ’01, maybe, that bike compared to a modern four-stroke is not even close. The way they can do the electronics now and just the pure horsepower numbers. Let’s be honest, guys have gotten faster, too. Everybody is on a training program now. They don’t get tired. They’re pushing it from the very get-go at 110 percent. I don’t think it’d be a bad idea to take the bike size down a little bit, just to keep the speeds down a little bit. I know there’s going to be arguments against that as well, and that’s logistically a hard thing to do for manufacturers to be like, “Oh yeah, we’ll just make 400s now instead of 450s.” That’s not really an easy overnight thing. I’m sure there is some kind of restrictor plate or whatever or some kind of rule they could make to make the 450 not as fast. Teams are always going to find a way around it and make a bike faster. I think it’s worth putting thought into, for sure. The sport is hurt when the marquee names are not out there. Definitely time to think about it. Matthes: Something that you have access to, is, riding for Husqvarna is, you just mentioned it—two-strokes, four-strokes, a 350, a 450. Never mind all the talk about injuries that we just had. What’s your ideal bike, Ryan, and what’s your ideal bike for every man out there, do you think? Which one would you put your money down on, out of all the models and all the things? Sipes: I like a 350. The 350 is the one I ride. I raced it in all the GNCCs. That’s the bike of choice there because the 450, you’re in the woods—you don’t need 70 horsepower. You can’t even use it. You can’t turn it. I’d compare a stock 350 to a factory 250, basically. It’s got a little bit more torque. I raced it at High Point last year, a 350 in the 450 motocross class, and I got 15th. I didn’t kill it, but I qualified tenth. The bike’s capable. And it won’t hurt you. I’m not a small guy, but the 450 can still scare you. You land and you give it a little bit more throttle than you wanted to, and whoa! Calm down, bike! It’s almost like the bike is a little bit more in control of you, where on the 350, I feel like I’m in control. So for an all-around bike, 350 is the way to go. Matthes: If you’re an everyman guy, you work a job but you race on the weekends and you’re an older vet guy or whatever, take a look at the 350 is what you’re saying? Sipes: Yeah, and they’re just more fun to ride. You ride a 350 like a 250. You rev it, where a 450, if you rev a 450, it’ll buck you off. They don’t like to be revved very much. Here’s the thing. You can ride a 350 as hard as you can, as hard as you want to, and it won’t scare you. You ride a 450 too hard and it will scare you. My choice is a 350. That’s what I ride everywhere except some of the nationals and flat track, obviously the you need the 450 for that, but the 350 is a good bike. 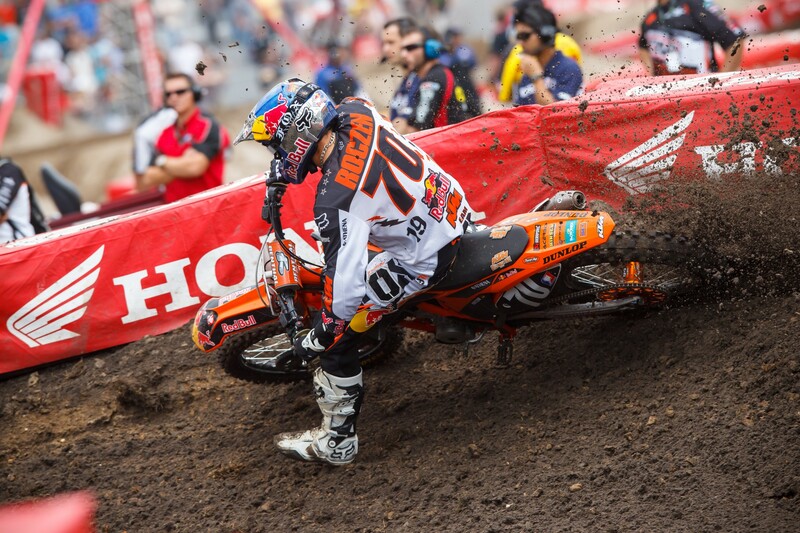 Matthes: Absolutely. I feel like they’re a little underrated. I don’t know if they’re great at the pro level for the ultimate elite guys. I don’t think you would put Marvin [Musquin] on one and watch him win races, but for 95 percent of everyone else, it’s more than enough bike for you. Sipes: That’s the thing. They build tracks for 450s. So if they built tracks for 350s, it would be great. That bike turns better. It’s easier to ride, so you can ride it harder. [Ken] Roczen rode a 350—it’s been a long time ago, around 2012 at Daytona and Seattle, and did really well. He is a smaller guy. He’s obviously super talented. He made it work. But like you said, you put Marvin on a 350 right now and he’s going to get worked. But if the tracks are a little different, if they changed it up a little bit, I think it could work. Qualifying report and results from the 2018 Spring Creek Motocross, round eight of the 2018 Lucas Oil Pro Motocross Championship. Take a lap with Marshal Weltin as he gives us the low-down on the 2018 MXGP of the Czech Republic.